Also serving communities of White Bluff, Centerville, Waverly. There are 3 Assisted Living Facilities in the Dickson area, with 2 in Dickson and 1 nearby. To help you with your search, browse the 10 reviews below for assisted living facilities in Dickson. On average, consumers rate assisted living in Dickson 4.3 out of 5 stars. Better rated regions include Brentwood with an average rating of 4.4 out of 5 stars. Caring.com has helped thousands of families find high-quality senior care. To speak with one of our Family Advisors about assisted living options and costs in Dickson, call (855) 863-8283. An active senior citizen community appeals to many residents in Dickson, Tennessee, which boasts a quiet charm and is located less than an hour from Nashville. Some senior citizens here opt to live in an assisted living community, which is a mid-level care facility for those who need more care than what is provided in a home for the aged but don’t need the high level of care that is offered by a nursing home. There are two assisted living facilities in the city and one additional facility in nearby White Bluff. All assisted care living facilities in Dickson are regulated by the Office of Health Care Facilities in Tennessee. Hot, humid summers with highs around 88 degrees in July and cold winters with average lows in January around 26 degrees are normal in Dickson, Tennessee. Some senior citizens might enjoy the light snowfall in the winter months. Senior citizens with respiratory challenges might appreciate the air quality in Dickson, which is a bit above the national average. On a rating system where higher numbers are better, the air quality in Dickson rates a 62, but the national average is 58. The crime rate for property crimes in Dickson is well above the national average and the violent crime rate is a bit over the national average, too. Higher ratings mean there is more crime, which may mean seniors need to be more careful than in other cities. The national average for property crimes is 38.1, but the Dickson rate is 65.7. For violent crimes, the national average is 31.1. In Dickson, it is 46.3. Senior citizens can arrange transportation through the Taxi Pilot Program for local trips. The minimum age for this service, which is free within the city limits or 10 miles out of it, is 60 years old. They can also find transportation through the MidCumberland Public Transit. Advance notice is required for all trips, including local and those to Nashville. The City of Dickson Senior Citizen Center has a vast array of activities for seniors to enjoy. There is a book club and a photo club. Craft classes occur regularly. There are also bingo games twice per week. A senior supper happens once per month, dances are offered once per week, and exercise classes are presented on weekdays. The Dickson area is home to world-class medical facilities, including TriStar Horizon Medical Center campuses, in the event of medical emergencies or illness. Assisted Living costs in Dickson start around $0 per month on average, while the nationwide average cost of assisted living is $4,000 per month, according to the latest figures from Genworth’s Cost of Care Survey. It’s important to note that assisted living rates in Dickson and the surrounding suburbs can vary widely based on factors such as location, the level of care needed, apartment size and the types of amenities offered at each community. Many senior citizens turn to the Home and Community Based Services waiver for help covering the cost of assisted living; however, this won’t pay for room and board. 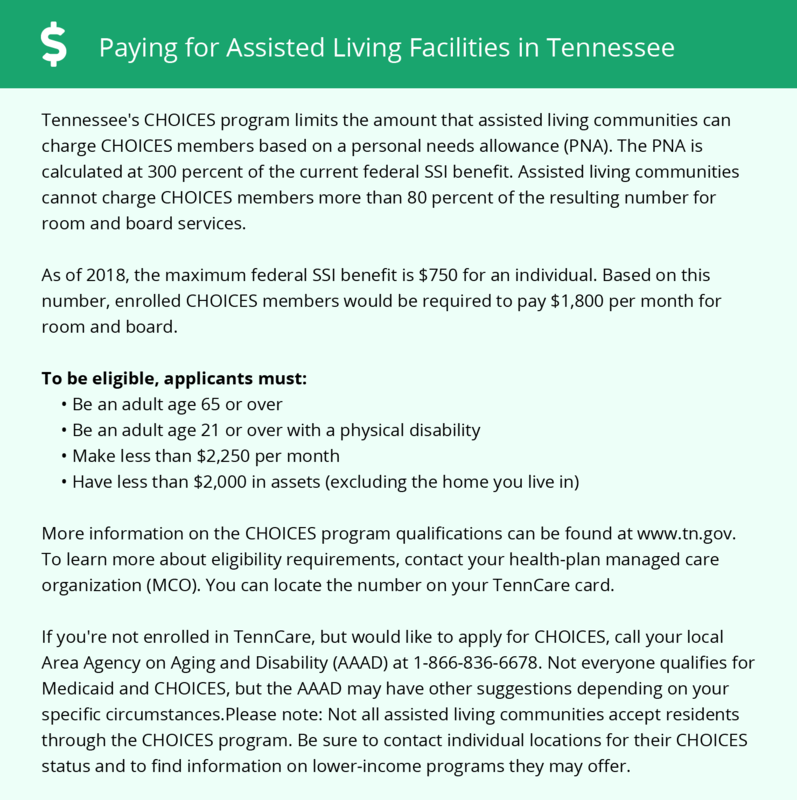 TennCare CHOICES in Long-Term Care Program helps eligible seniors who want to live in an assisted living communities by paying for nursing and personal care services in such a facility. Room and board aren't eligible for the Medicaid Waiver. Dickson and the surrounding area are home to numerous government agencies and non-profit organizations offering help for seniors searching for or currently residing in an assisted living community. These organizations can also provide assistance in a number of other eldercare services such as geriatric care management, elder law advice, estate planning, finding home care and health and wellness programs. To see a list of free assisted living resources in Dickson, please visit our Assisted Living in Tennessee page. Dickson-area assisted living communities must adhere to the comprehensive set of state laws and regulations that all assisted living communities in Tennessee are required to follow. Visit our Assisted Living in Tennessee page for more information about these laws.